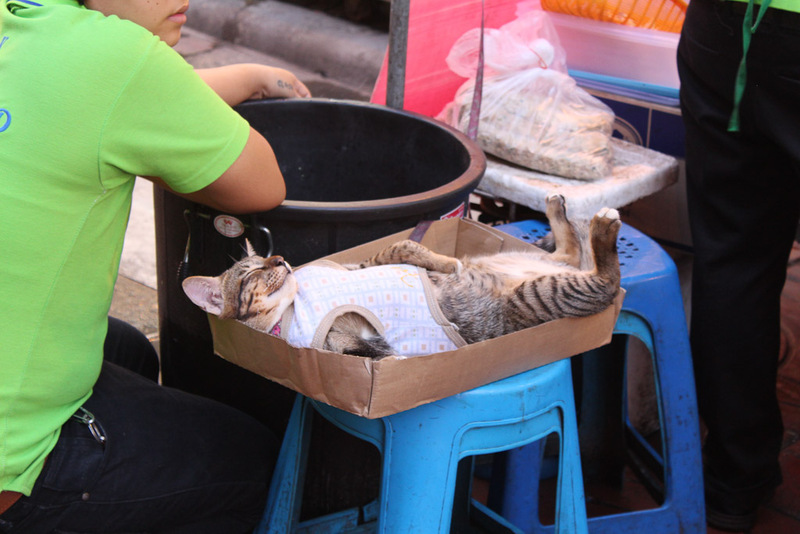 We decided to have a lazy morning after our hectic day the day before, so we hung around Khao San and Rambuttri, got a brutal Thai massage, had a pad Thai off the street, and lazed around by the rooftop pool. Bliss! Chinatown was beckoning so we wandered out Phra Arthit pier on the river and caught a river ferry a couple of stops to the one closest to Chinatown. We didn’t really know what we were doing so we just crammed in with a load of other people and paid our 15B fare. It seemed to work as we got to where we wanted to go fairly easily! 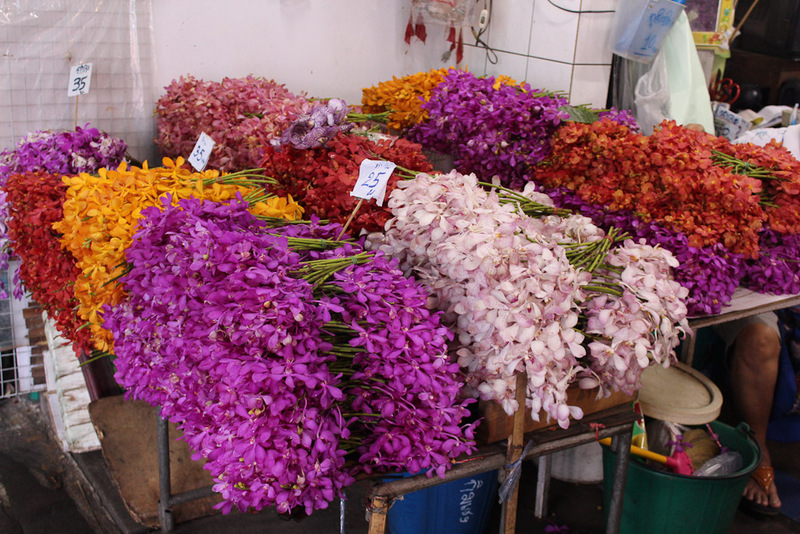 Next to the pier was the Flower Market (Pak Khlong Talat). It was fairly late in the day so most of the stalls were being packed up, but there were still plenty of gorgeous flowers around. They were so cheap too! 50B ($2) for a huge bunch of red roses – amazing. We made our way up towards Chinatown, and passed through part of Little India – obvious for its multitude of textile shops. 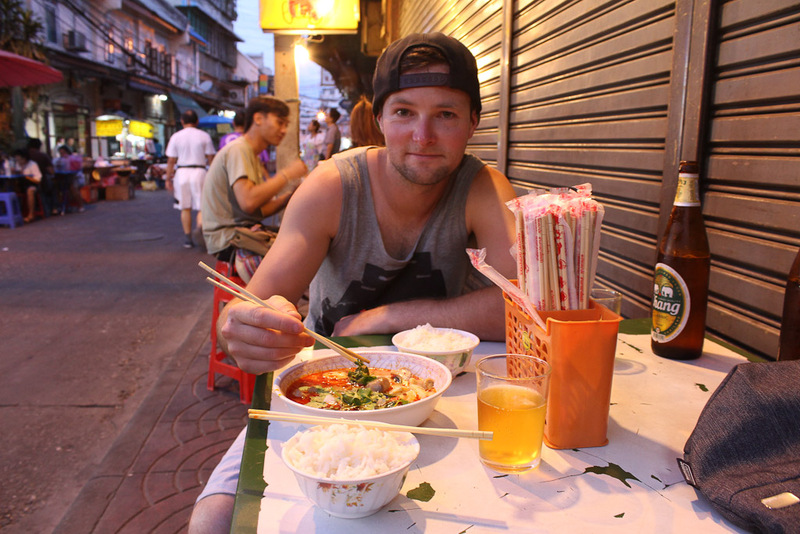 The main market in Chinatown is called Sampaeng Lane, which is a walking street – just as well, as there was only about a metre of walking room in between the stalls! 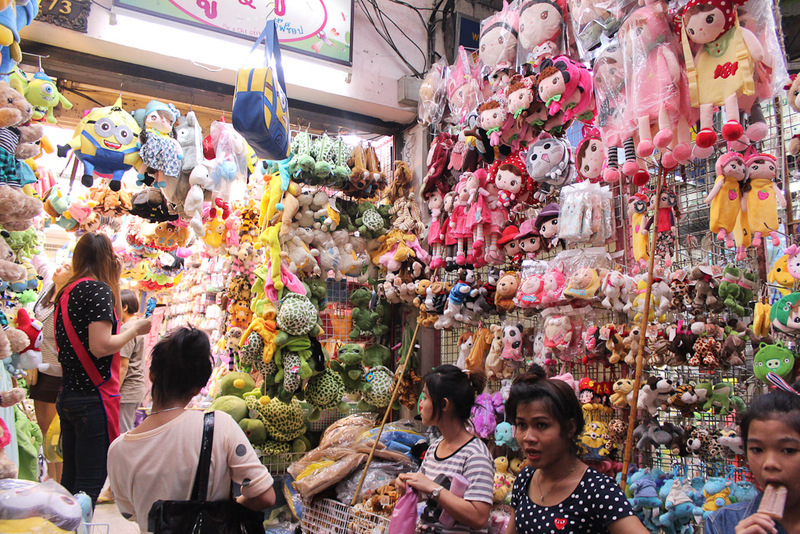 The amount of stuff there was mental – and it was just crappy plastic Chinese stuff, like phone cases and key rings and buttons and Hello Kitty paraphernalia. Nothing that we wanted to buy but it was interesting to walk through! 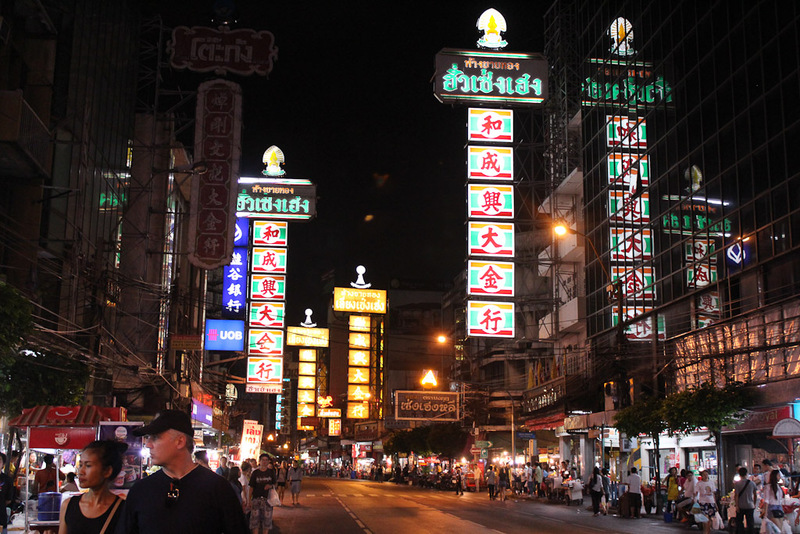 We ended up on Yaorawat Road, the ‘neon strip’ of Bangkok. 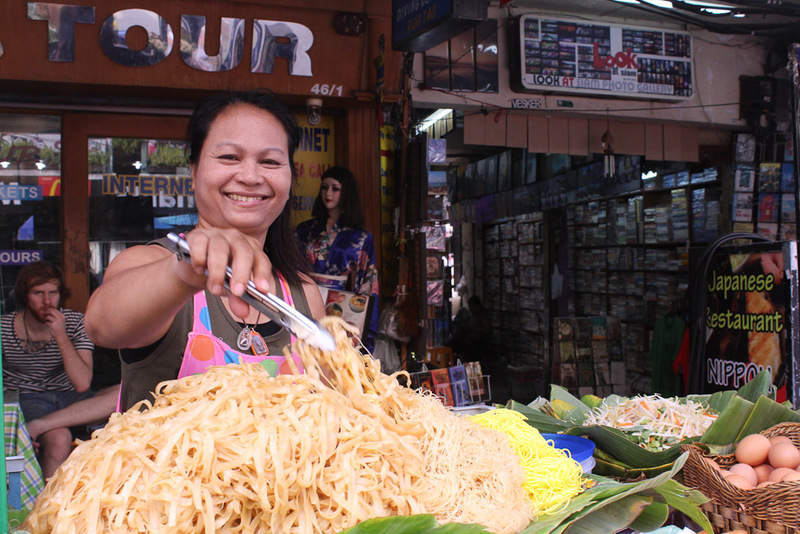 Lots of street stalls serving all sorts of goodies set up along this road and the lanes adjoining it every night (apart from Mondays when there is a law stating no street vendors are allowed to operate). We found a stall up a lane and had tom yum soup, stir fried broccoli, and two big Chang’s for dinner – all for 300B and absolutely delicious. 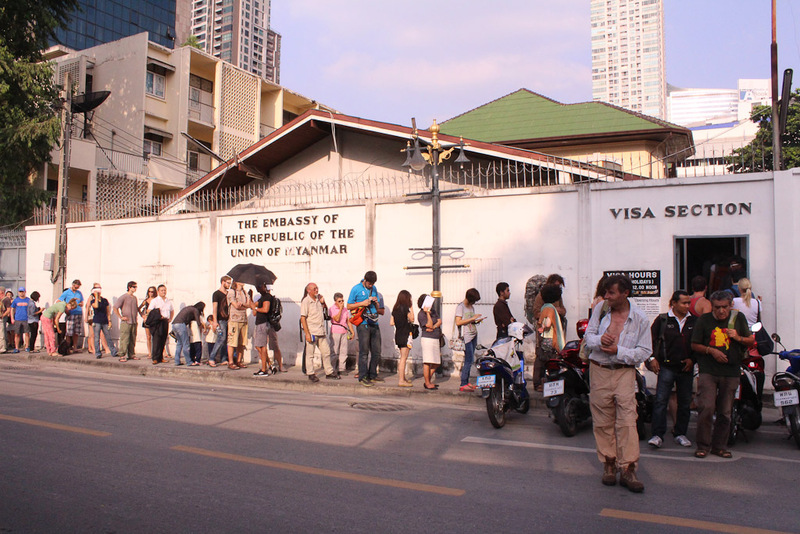 Next morning we headed off to Sathorn via tuk tuk and Skytrain to get our visa for Myanmar from the embassy. It turned out to be a fairly simple process, but required a bit of waiting. On our way back to Khao San from the embassy we got our first taste of tear gas – with the protests being quite close to where we are staying it’s a bit hard to get back into the KSR area without going close to them! Our tuk tuk driver got us out of the area pretty quickly and took the long way around. Not too sure what was happening but the tear gas wasn’t nice! We got just a whiff but it was pretty acrid and made our eyes water and noses sting. Yuck! 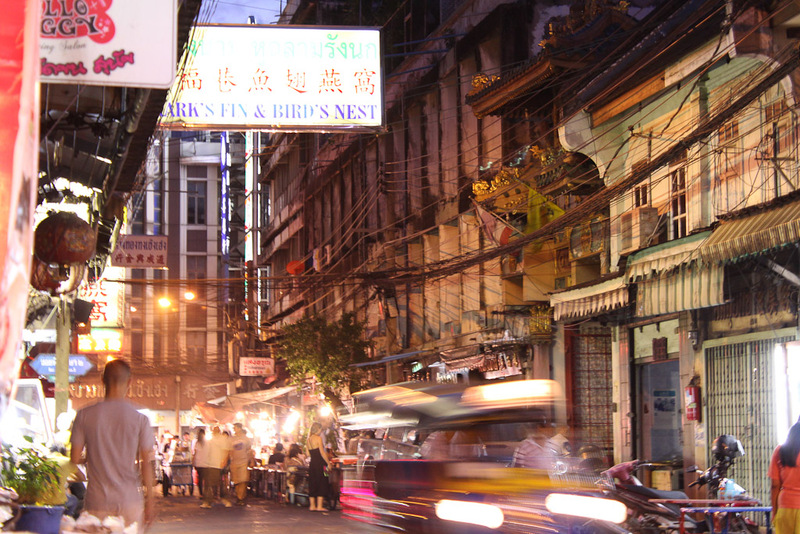 Off to Myanmar tomorrow – can’t wait!